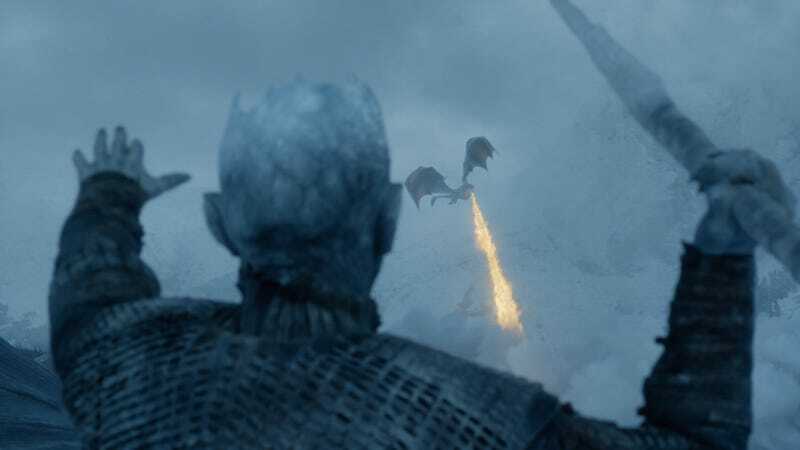 Earlier this year, several Game Of Thrones stars claimed that they had no idea how the series finale was going to end, with Nikolaj Coster-Waldau revealing that the actors had digital versions of the scripts that would automatically delete themselves, and Maisie Williams seemingly breaking protocol by teasing that she’s going to kill everyone and get blood all over her tennis shoes by the end. Basically, we really don’t know anything concrete, which may have something to do with how dramatic HBO’s anti-leak procedures were. Apparently, the network even utilized a “drone killer” to stop anybody from sneaking aerial photos during filming. That came from Sophie Turner, who said during a New York Comic Con appearance that the production had a system that “creates a field” around the set and automatically kills drones, which she said is “very X-Men” (always on-brand, that Sophie Turner). Entertainment Weekly looked into this a bit, and it sounds like the real “drone killer” is actually much cooler. The LAPD have apparently been using these things for a few years to stop people from illegally watching the Rose Parade, but it’s apparently a rifle-like device that “fires” a wide beam and disables any drone it hits within a half-mile.